The 3-story building was designed in 1920 by architect Pierpont Davis for the Sun Drug Co., who would initially occupy the prime space on the ground floor corner. While it was still under construction, Goldberg contracted with Chicago architects Taussig and Flesch of Chicago on designs for the upper floors that were to house Swelldom. 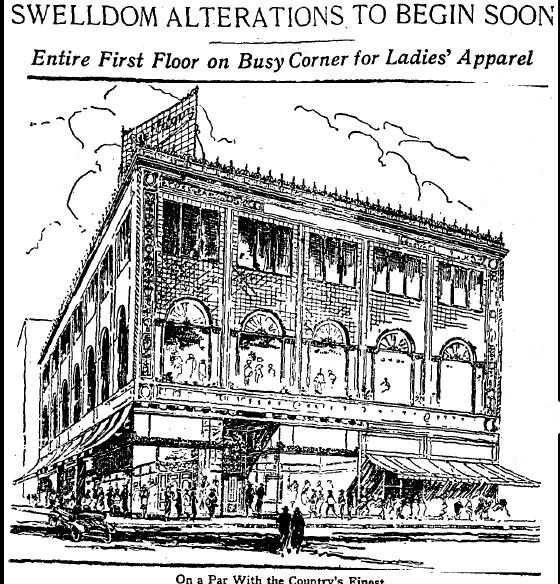 In November, the ladies’ wear emporium moved in from its previous quarters nearby at 535 S. Broadway. Founded c. 1897, it had been on Broadway at No. 521 S. Broadway since 1903, as the Swelldom Cloak & Suit House. 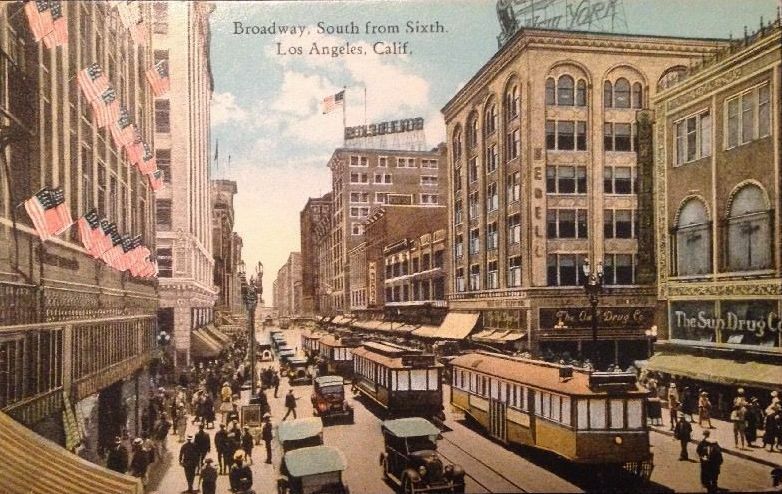 Sun Drug and Swelldom on the northwest corner of 6th and Broadway, c. 1920. Sun Drug soon ran into financial difficulties, and at the outset of 1925 Goldberg was able to take over the entire building. The expanded store opened in March with an enlarged millinery department, perfume, shoe, cosmetics, and leather goods departments. The display windows along Broadway were works of art, featuring realistic wax mannequins from France. 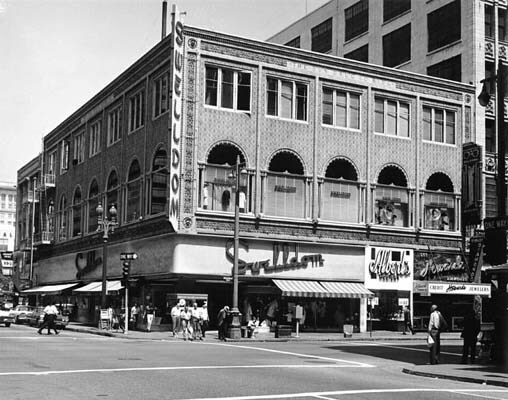 Swelldom c. 1937 after a streamlined moderne makeover of the lower floor, which was damaged in an explosion at the Owl Drug across the street in October 1935. Herman Schultheis photo. LAPL. Harry Goldberg died in 1942, but Swelldom continued on, thrived even. 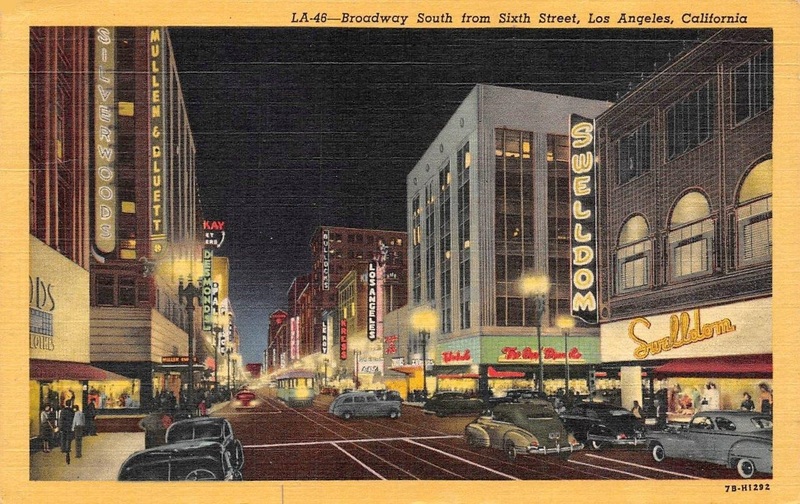 On September 9, 1943, in the midst of World War II, a second Swelldom opened in Beverly Hills, at 9567 Wilshire. 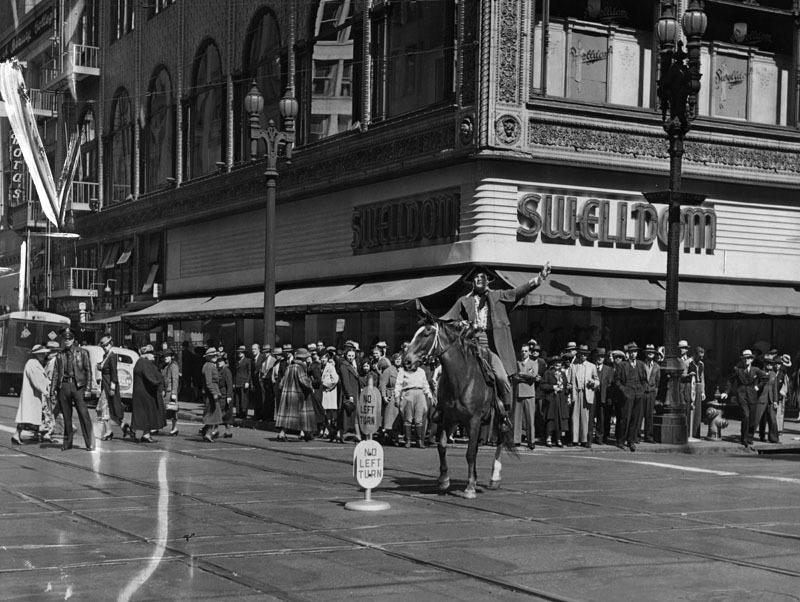 Opening of Swelldom Beverly Hills at Wilshire & Camden, 9-9-1943. 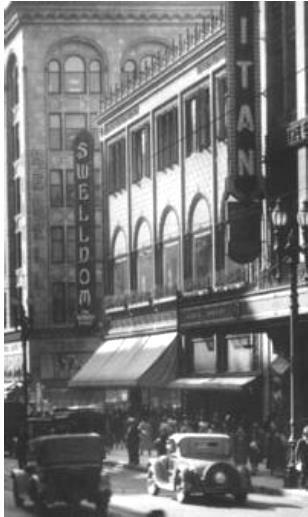 On January 21, 1946, Swelldom opened its remodeled and enlarged quarters at the Sixth and Broadway store. “The expansion of our downtown store and the opening of our Beverly Hills shop in 1943 attest the firm faith we have in the future of Los Angeles as a style center,” president Louis W. Roth told reporters. 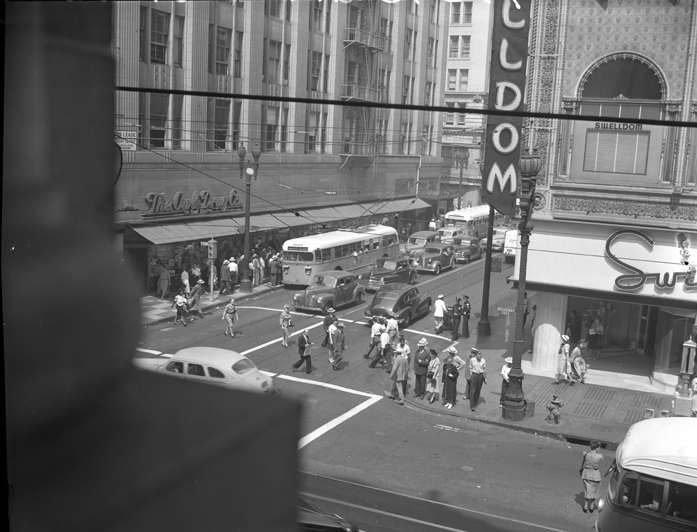 Swelldom’s windows seen in a photo 8/4/1947, the day “trackless trolleys” debuted. LAPL . His faith seems to have been well-founded. The Beverly Hills shop closed around 1950, but the original location was still going into the 1970s.